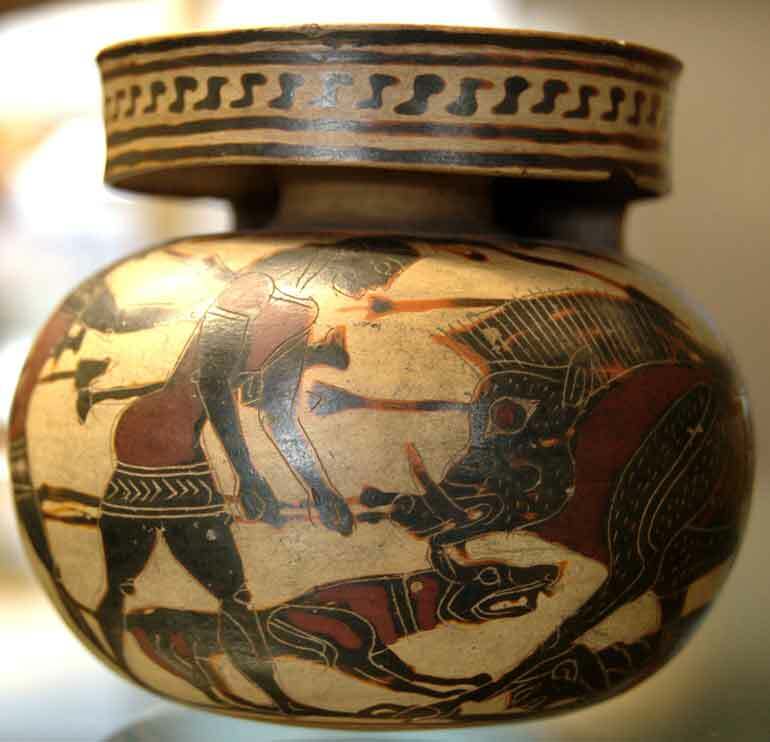 The hunt of the Calydonian boar (us kalydonios) is one of a series of Archaic Greek myths describing a gathering of heroes for the achievement of some great purpose, which in this particular case was the slaughter of a chthonic monster threatening the city of Calydon in western Greece. The myth of the Argonauts and their quest for the Golden Fleece was similarly such a gathering of heroes, as was the storming of Thebes by Polyneices and the Argives, and the Trojan War. In Calydon, the monstrous boar, a wild swine, was sent by the goddess Artemisa to devastate the fields and vineyards of the town. Today, nothing is left of Calydon, save the ruins of a temple to that same goddess. 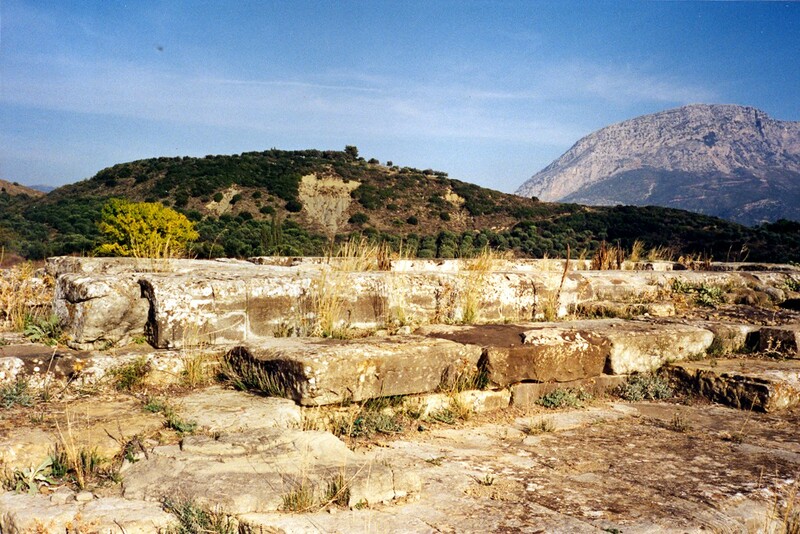 Located about a mile north from the shore of the Gulf of Corinth in Aetolia, the city of Calydon (In Greek: Καλυδών; gen.: Καλυδῶνος), was never very large. 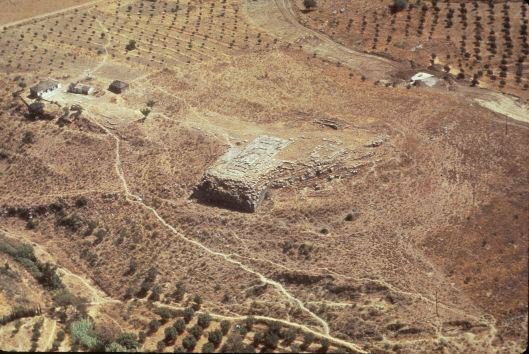 In the third century BCE, it was encircled by a wall and a fortified acropolis was built on the hill. 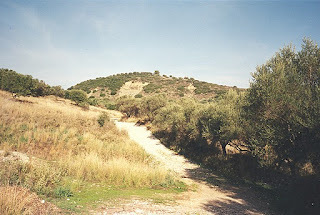 The sacred road which led to the Sanctuary of Artemis Laphria is still visible today. Laphria was an earlier goddess whose worship antedates that of the Dorian Artemisa, and hence a syncretism of beliefs must have occurred in the region. 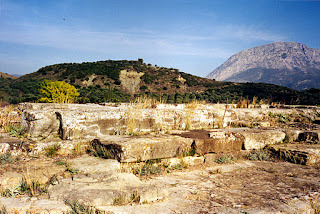 There was a second Archaic temple on the acropolis, dedicated to Artemisa’s brother, Apollo Laphrios, and together the two shrines came to constitute an important sanctuary. 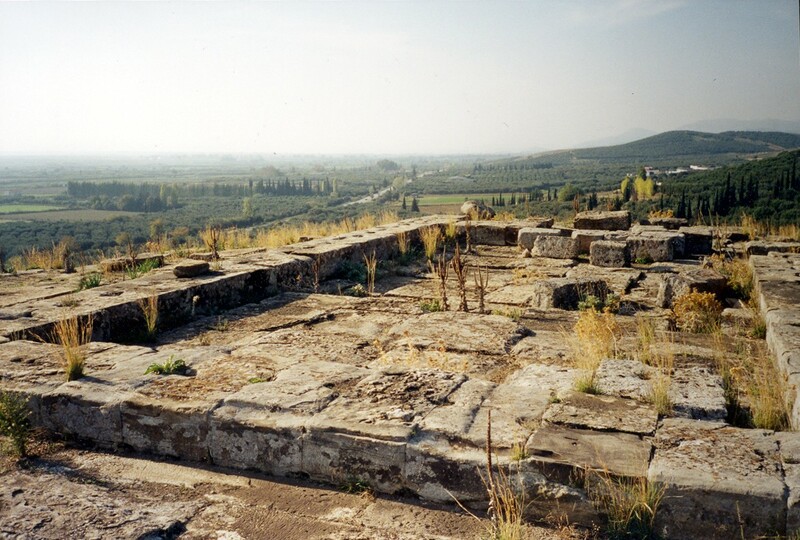 Ruins of the Temple of Artemis Laphria in Kalydon: The fourth century BCE Sanctuary of Artemis Laphria, excavated by Danish archaeologists under the leadership of Frederick Poulsen in 1925-32 stood on a platform erected on a terrace which is supported by sixth century retaining walls. From its privileged position above a natural spur of the hills it is possible to see the Gulf of Corinth and the city of Messolonghi below. Aerial view of Kalydon: In this photograph, taken from the North, the terrace constructed below the temple of Artemisa Laphria is clearly visible in the center of the picture. 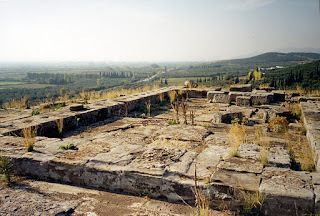 Under the Roman conquest, the city declined, and in 30 BCE, after the Battle of Actium, Octavius Augustus transferred the inhabitants to the new city of Nikopolis (city of victory), further north, on the coast of the Ionian Sea. The town never reached the dimensions of a large city and gradually vanished during the Middle Ages. To the right of the sacred way are the ruins of a Heroön (temple to the goddess Hera), the foundations of which are visible in the photograph above. The earliest archaeological description of the site was that of the English antiquarian and topographer William Martin Leake, whose account of his discoveries in the area, Travels in Northern Greece, was published in 1835. 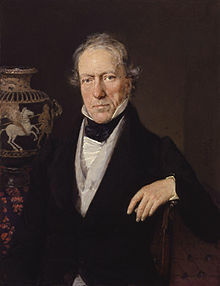 In the 1890’s, the site was visited by the Englishman William John Woodhouse (1866-1937), a Victorian classical scholar. 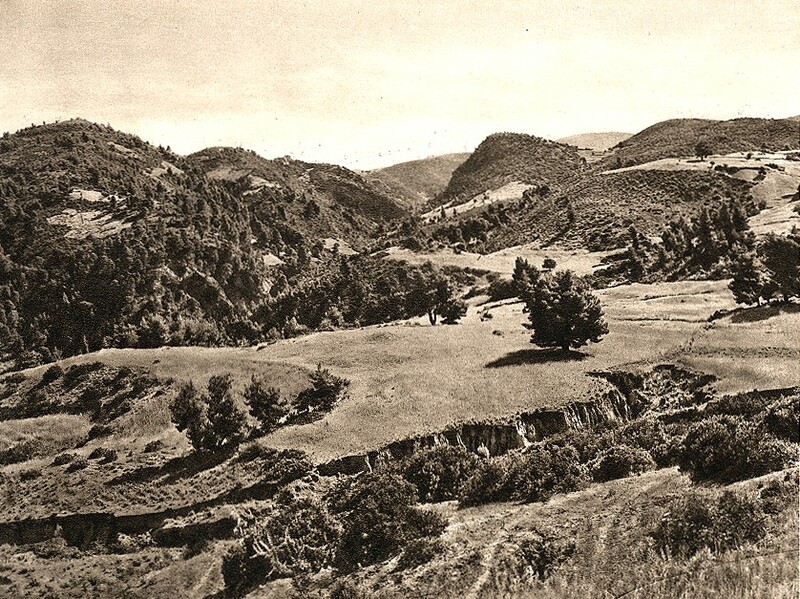 As a Newton student of the British School of Archaeology in Athens, and Craven Fellow, he undertook a thorough topographical exploration of the rugged and little known Aetolian country in 1893. He published the results of his field-work in the Journal of Hellenic Studies and, in 1897, a substantial book, Aetolia. Archeological excavations of the area were begun in 1908 by the Greek Archeological Society of Athens under the direction of Dr. George Sotiriades. In the period 1926-1932, joint Greek and Danish excavations were carried out under the archaeological team of Frederick Poulsen and Konstantinos Romaios, which had also been exploring and digging in Corinth. 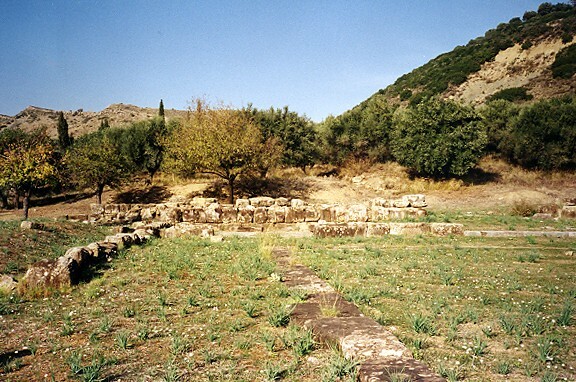 Today, the ruins are open to visitors, located right off the E-55 highway that runs along the north shore of the Corinthian Gulf in Aetolia, near the small modern town of Evinochori, and about eight miles east of the Gulf city of Messolonghi. Homer mentions Kalydon as the home of Oeneus (Greek for “wine man”), and makes reference to the hunt for the mythical wild swine in the Iliad. The gigantic boar was sent by Artemisa to ravage the country and the vines around Calydon so as to punish Oeneus, its king, for neglecting to offer the first fruits of the harvests to her. 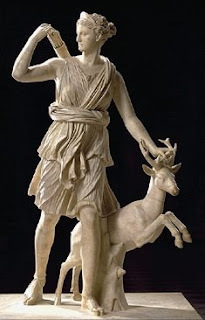 Artemisa was the Greek goddess of wild animals and of the chase, among other various things, and she was also a Dorian goddess, a goddess of the Dorian conquerors who descended on Greece and occupied its ancestral lands. It is reasonable to suppose that the myth evokes the punishment of an earlier people of Calydon for their reluctance to adopt the worship of the goddess of their conquerors. The boar that Artemisa sent to Calydon ravaged the countryside, destroying vines and crops and causing the farmers to seek refuge in the town. King Oeneus, in despair, summoned the heroes from throughout Hellas to hunt the beast and offered its skin and tusks as a reward. The heroes responded, although Heracles was significantly not among them. There is a myth of Heracles hunting his own mythical boar, the Erymanthian. 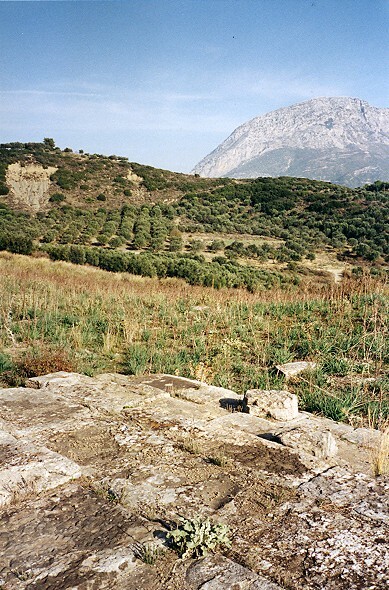 The names of those who did participate in the hunt at Calydon include the semi-mythical, semi-divine, progenitors of the ruling houses of many of the Dorian cities of Greece, and include some of the Argonauts. The hunt was led by the king’s son, Meleagros, who struck the boar down. 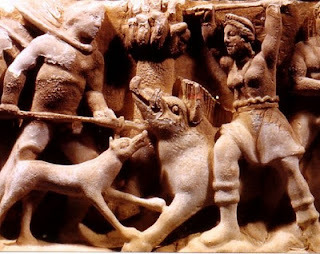 He gave the skin to the beautiful huntress Atalanta as a prize and she, in turn, hung the boar’s skin from a tree in a sacred Arkadian grove and dedicated it to Artemisa. The various accounts of the myth were later compiled by Ovid and re-told in the Metamorphoses. 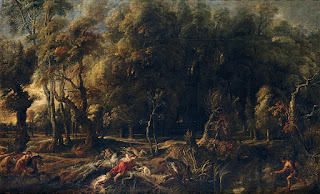 Among the hunters were Theseus, the founder-king of Athens and son of the god Poseidon; Peleus, one of the Argonauts and father of Achilles, whose connection with Pisa and the Olympian Games has made doubly famous; Nestor, the old man of the Iliad, who was “still in his prime” according to Ovid; Asclepius, son of Apollo and founder of the medical profession; Deucalion, son of King Minos of Crete; Laertes, the father of Odysseus, and the famous Gemini twins, Castor and Pollux, sons of Leda and a swan (Zeus), and brothers of Helen of Troy and Clytaemnestra, Queen of Sparta. Most significant among the hunters, however, was the huntress Atalanta. “Atalante in days of yore, Arkadian Iasios' daughter, whose shaft slew Kalydon's boar. 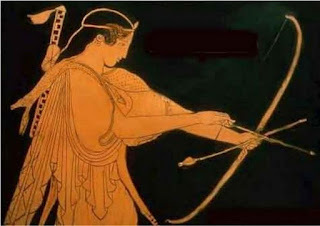 Yea, the heroes who, summoned to hunt the terror of Kalydon, came could dispraise not her prowess: the tokens of that her victory to Arkadia were brought, and the tusks of the boar there yet may ye see.” Callimachus, Hymn 3 to Artemis, 218 ff (trans. Mair). She had been suckled by a she-bear, Artemisa herself in disguise, and raised as a huntress by the goddess, so why was she there, hunting Artemisa's own boar? Because as a stand-in for the goddess she became a source of dissension among the hunters, as many of the men refused to hunt alongside a woman. But Meleagros, who fell in love with her, succeeded in persuading them to do so. 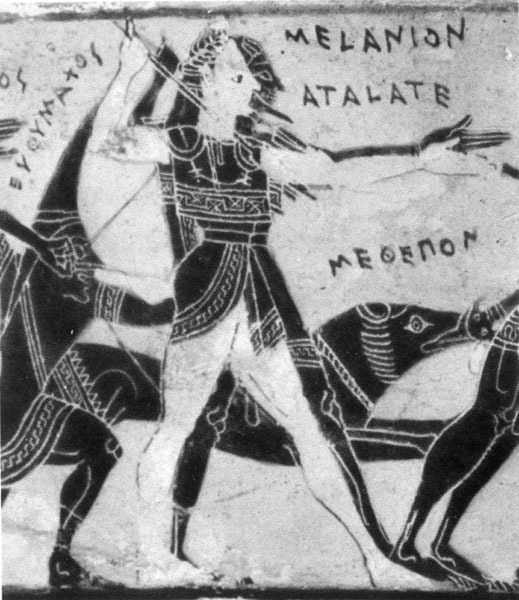 Atalanta was the first to wound the boar with an arrow, and when Meleagros killed the boar, he gave the dead boar’s skin as prize to Atalanta. "But the goddess again made a great stir of anger and crying battle, over the head of the boar and the bristling boar's hide . 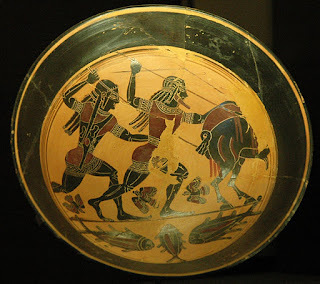 . . .” (Iliad, ix, 543) Indeed, the trouble did not end there, for some of the men objected to the woman receiving the prize of the hunt, and the subsequent fight over the trophy led to the death of Meleagros, which was Artemisa’s final revenge against Oeneus. The boar’s skin was said to have been preserved at the Temple of Athena Alae in Tegea, where Pausanias saw it in the second century A.D. The relic, “which time has shriveled and left without a single bristle . . . ,” was clearly nothing much to look at. ( Pausanias, Guide to Greece, vol.2, viii, 47). He reports that the tusks of the boar were taken by Octavius Augustus after Actium. The keepers of the Temple of Athena Alae told him that one of the tusks was broken, but the other was kept in the Emperor’s gardens, in a Sanctuary of Dionysos, in Rome, and it measured “just three feet long.” (Guide to Greece, vol.2, viii, 47). “When Oineus [king of Kalydon] was offering his annual sacrifice of the first fruits of the land to all the gods, he overlooked Artemis. 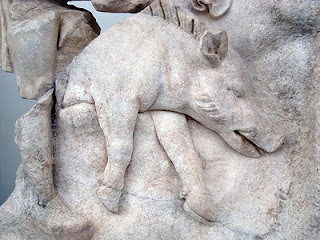 The wrathful goddess let loose a great and powerful wild boar, which made the earth unsowable and destroyed herds and people that encountered it. In order to get rid of this boar, Oineus called together all the best men of Hellas and proclaimed the skin as a trophy to the man who could slay it. 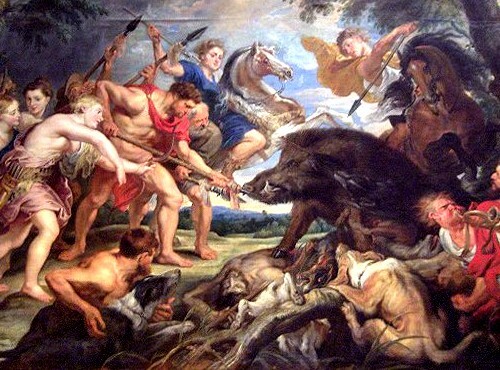 Here are the people who gathered for the boar hunt: Oineus’ son Meleagros, and Dryas, son of Ares (both from Kalydon); Idas and Lynkeus, sons of Aphareus, from Messene; Kastor and Polydeukes, sons of Zeus and Leda, from Lakedaimon; Aegeus’ son Theseus from Athens; Admetos, the son of Pheres, from Pherai; Iason [Jason], Aeson’s son, from Iolkos; Iphikles, Amphitryon’s son, from Thebes; Peirithoos, son of Ixion, from Larise; Peleus, son of Aiakos, from Phthia; Atalante, the daughter of Skhoineus, from Arkadia; and Amphiaraos, the son of Oikles, from Argos. The sons of Thestios also attended the hunt. When they had gathered, Oineus entertained them for nine days. On the tenth day, Kepheus and Ankaios [two of the hunters from Arkadia] and some of the others refused contemptuously to go out hunting with a woman, but Meleagros, though marries to Idas’ and Marpessa’s daughter Kleopatra, still wanted to make a child with Atalante, and so compelled the men to join the hunt with her. 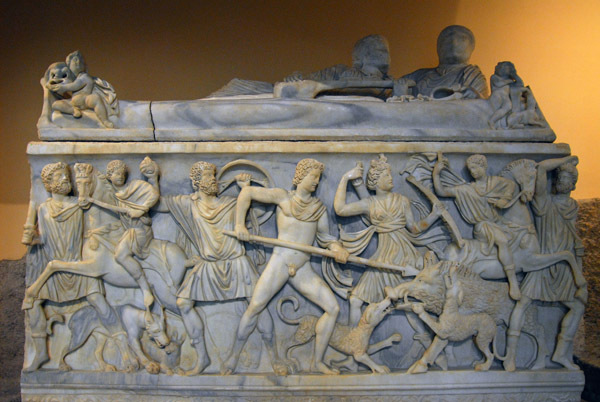 When they had encircled the boar, the animal killed Hyleus and Ankaios, and Peleus accidentally speared Eurytion [king of Phthia] with his javelin. Atalante was first to hit the boar, in the back with an arrow. Amphiaraos then got it in the eye, and Meleagros killed it with a blow on the flank. When he received the skin, he gave it to Atalante. But the sons of Thestios, who considered it disgraceful that a woman should get the trophy where men were involved, took the skin from her, saying that it was properly theirs by right of birth, if Meleagros chose not to accept it. Outraged by this, Meleagros slew the sons of Thestios and again gave the skin to Atalante. But Althaia, in grief over the death of her brothers, set fire to the brand [that the Moirai declared when consumed would end the life of Meleagros], and Meleagros died on the spot. Some say, however, that . 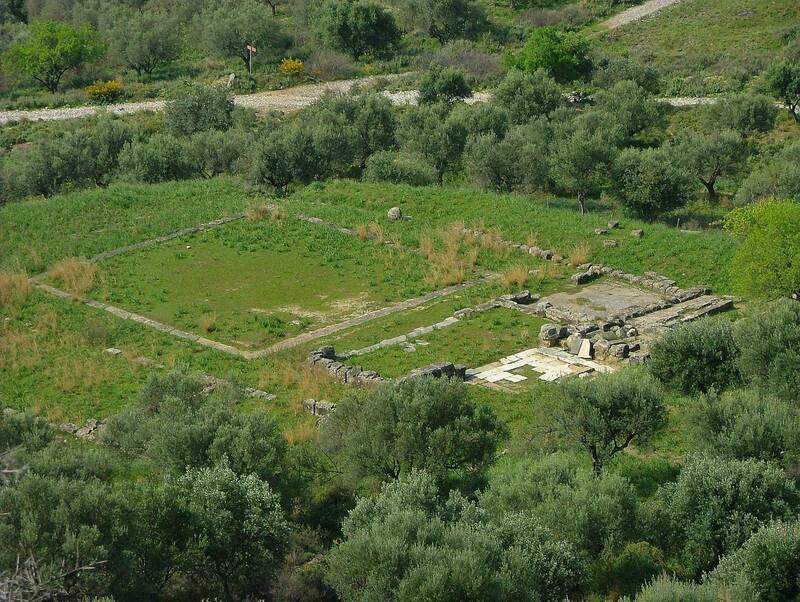 . . the sons of Thestios claimed the skin on the grounds that Iphiklos had first hit the boar. A war then ensued between the Kouretes [an Aitolian tribe] and the Kalydonians.” Pseudo-Apollodorus, Bibliotheca 1. 66 (trans. Aldrich). Rubens, The Hunt of Meleagros and Atalanta (1617-1618), Kunsthistorisches Museum, Vienna. In Rubens' paintings, Atalanta is always rather disheveled, a plump, blonde Flemish woman with her right breast bare, in the manner of the Amazons. In the painting above, she has just flung an arrow, or some missile, at the beast, as, according to the myth, she was the one who drew first blood in the hunt. “Are you surprised to see a girl [Atalanta] entering into so great a contest and withstanding the attack of so savage and so huge a boar? For you see how bloodshot is his eye, how his crest bristles, and how abundant is the foam that drips from his long upright tusks, which are un-blunted at the point; and you see how the beast’s bulk is proportional to his stride, which indeed is indicated by these tracks that are as large as those of a bull. For the painter has not failed to embody any of these points in his painting. But the scene before us is already terrible. For the boar has attacked Ankaios here in the thigh, and the youth lies pouring out his blood in streams and with a long gaping wound in his thigh; therefore now that the contest is already under way, Atalanta--for we must recognize that the girl is she--having put to the bowstring the arrow she has ready, is about to let it fly . . . The youths here are Meleagros and Peleus, for the painting tells us that it is they who have slain the boar; Meleagros in an attitude of defense throws his weight upon his left foot, and watching closely the boar’s advance, awaits his onset securely with couched spear . . . the hip is the kind to make us confident that the youth will not be overthrown by the boar’s attack . . . So much for the son of Oineos; but Peleus here holds his purple mantle out before him; and he holds in his hand the sword given him by Hephaistos, as he awaits the rush of the boar; his eye is unswerving and keen of glance.” Philostratus the Younger, Imagines 15 (trans. Fairbanks).